Sometimes all you need a two-biter to make your day. 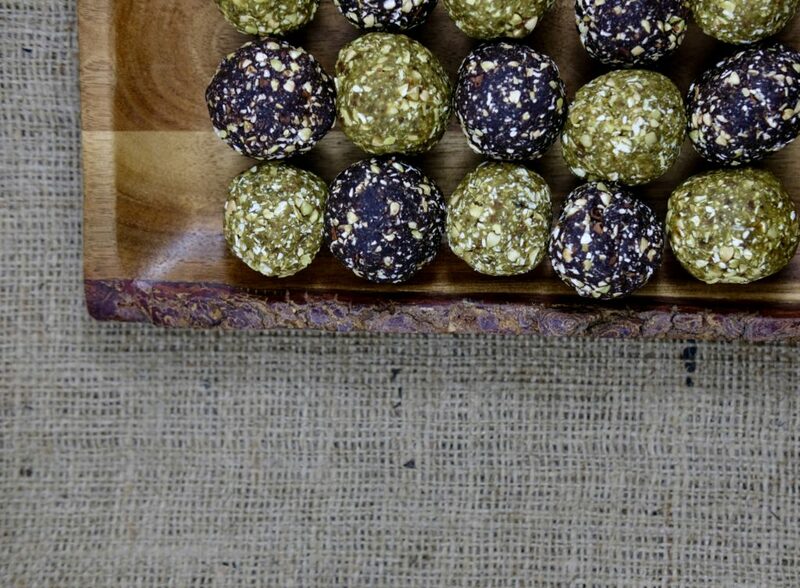 Need it to be gluten-free, nut-free and packed with nutrients? Look no further. 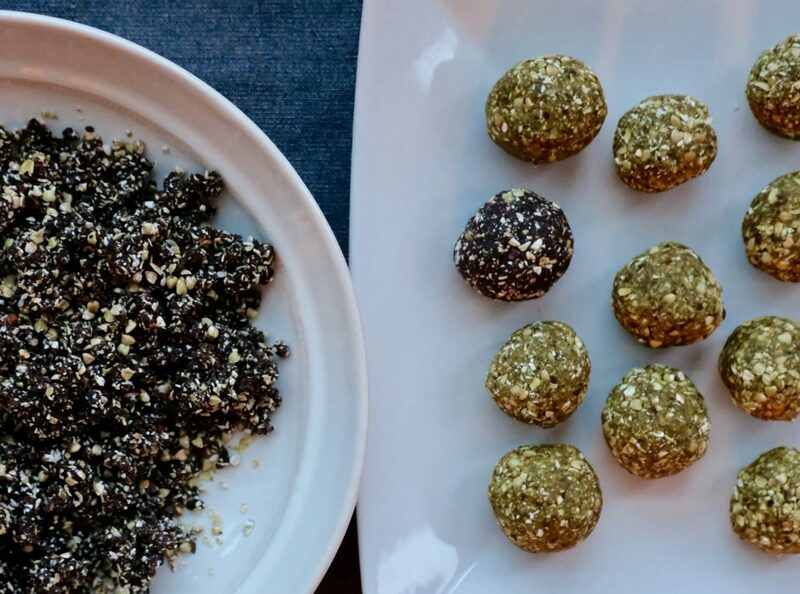 Here’s a two-bite morsel (AKA meteor ball) that will make you bounce of the walls from all that whole-food, plant-based energy. Not to mention… make your taste buds sing. 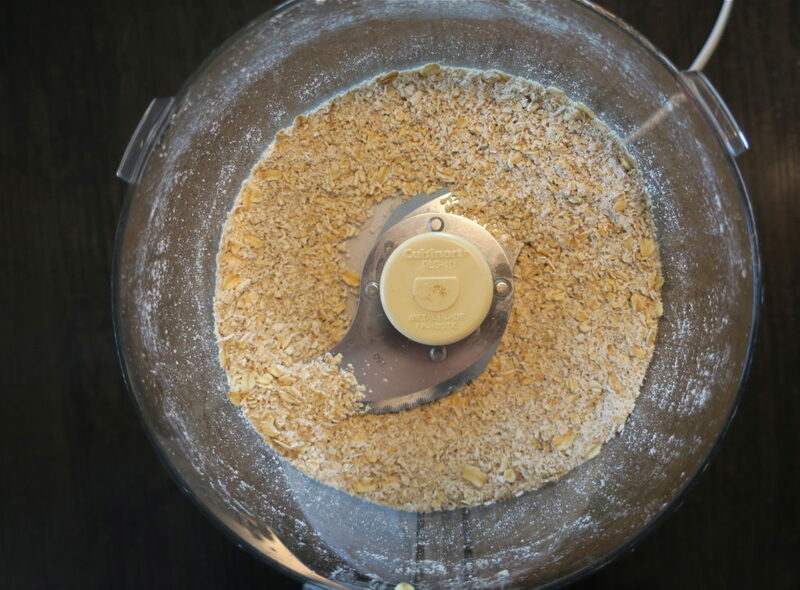 Easy as dump, blend, roll. It’s festival season. It’s camping season. T’is the season for glorious balls of tasty nutrients. These are perfect for camping. 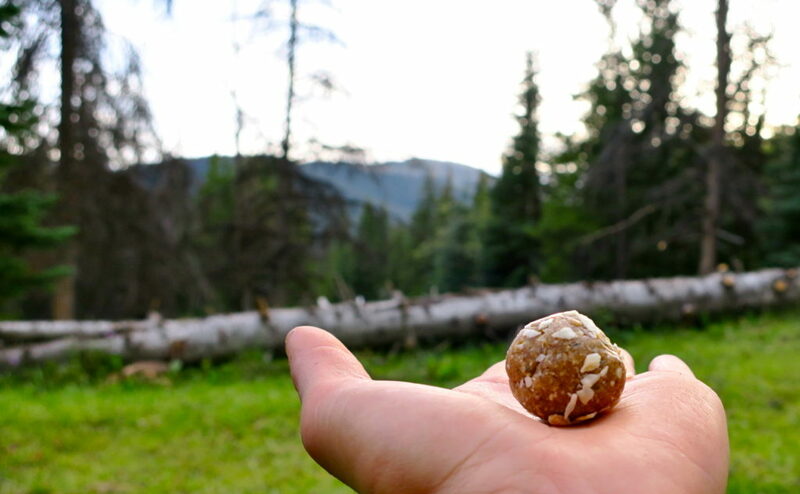 You can take them in a big zip lock, and keep them in your cooler until you head off on your hike, then transfer to a little baggy to stash them in your back pack. Or, if you’re ever needing a little boost of energy at a festival, meet your new best friend. There’s nothing like a hand-to mouth treat that is actually healthy for your cells, your muscles, your brain, your digestion… and of course, your dance moves. 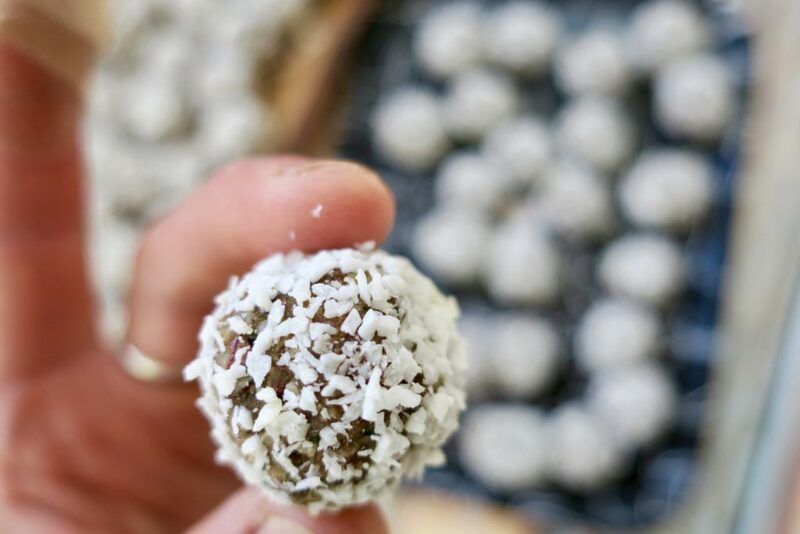 This weekend calls for these little bites. Bass Coast is coming up, which it’s all about taking your dance shoes out and busting a move. 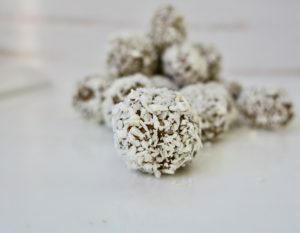 Since cooking time will be squeezed out of the schedule because of all of the art to look at, people to learn from and dancing to do, these are the PERFECT bites to bring in a cooler to keep us sustained for the festivities. Oh ya! 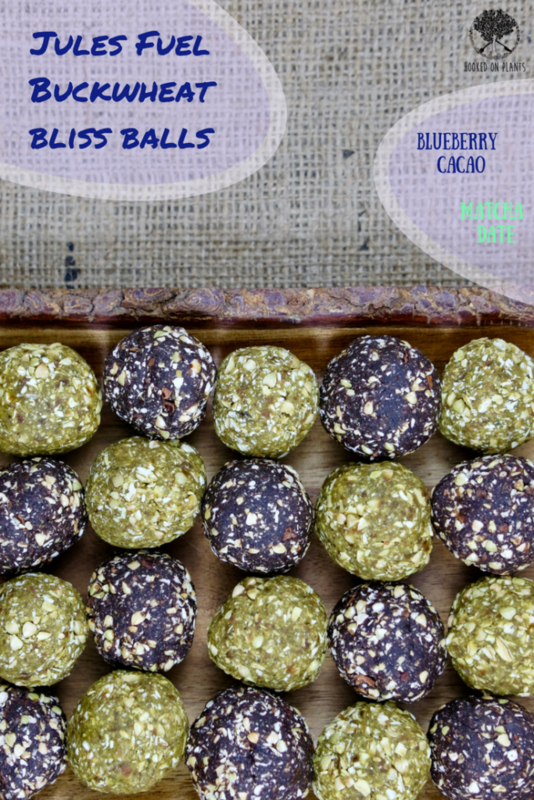 And, I’m excited to be bringing these balls to the Hooked On Plants Bass Coast workshop too! While we’re on the topic let’s talk festival eats! What eating at a festival really means is snacking on the go. It’s important to bring snacks that will sustain you, hydrate you, and fill you up with nutrients and good energy. And water. LOTS and lots of water. 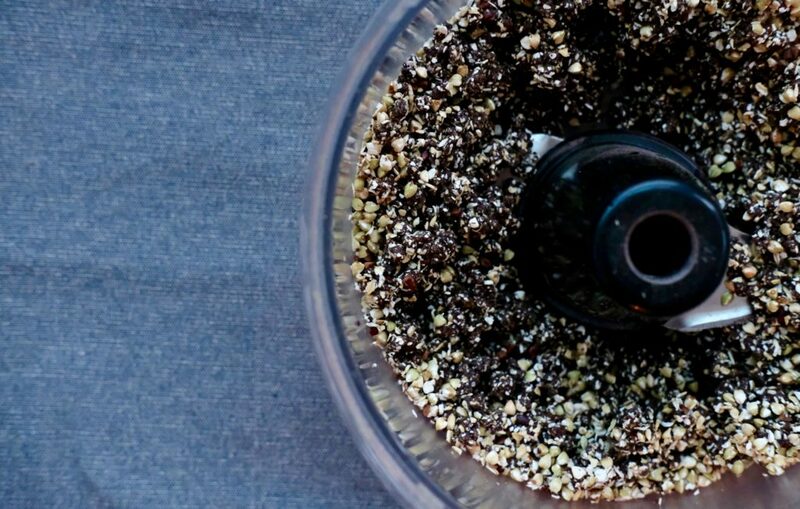 Throw in some electrolytes or even a dash of Himalayan salt, and you’ll be loving it. Bring along your favourite green powder to throw in your water bottle in the AM. Rice, Beans, Guac, Salsa, Wraps. Enough said. Ok, now back to the balls. 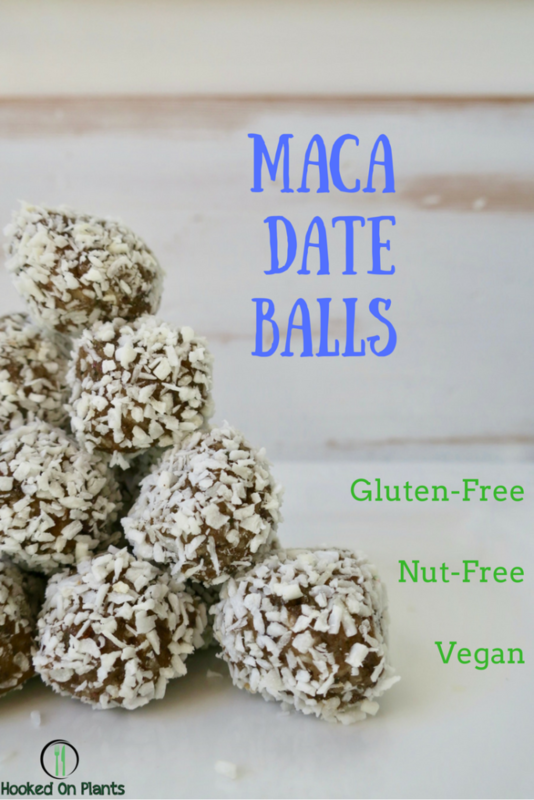 The magic ingredient in this recipe is Maca. 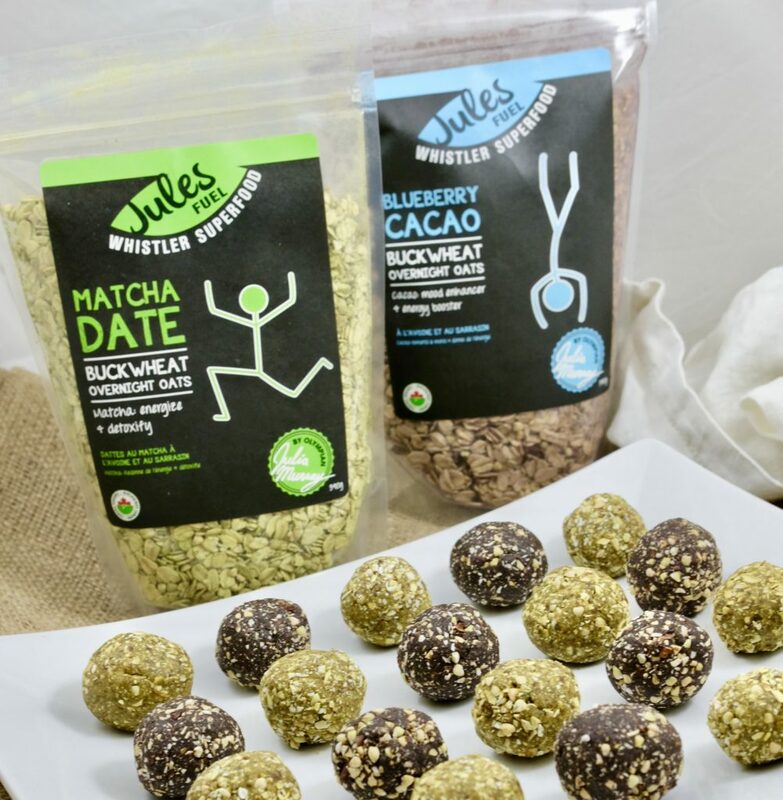 ~Dates are the base to these ‘meteor balls’. 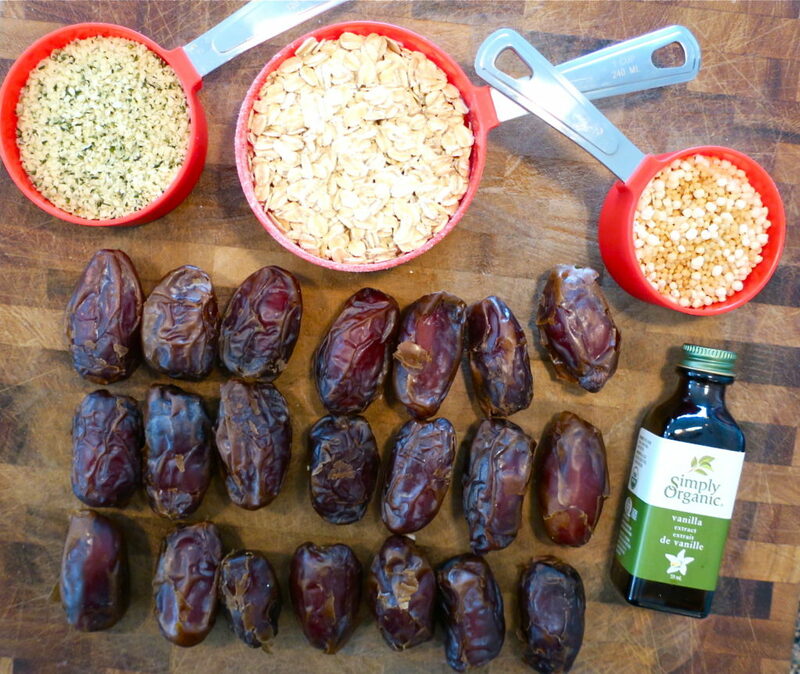 Dates pack a mean punch of minerals, fibre, and clean, easily digestible energy. Perfect for the summer adventures. 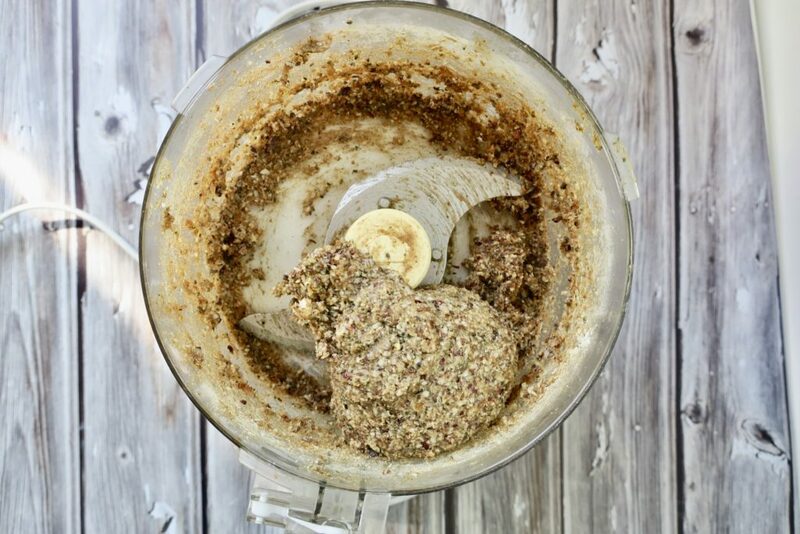 ~Hemp seeds bring a complete plant-protein to the mix. 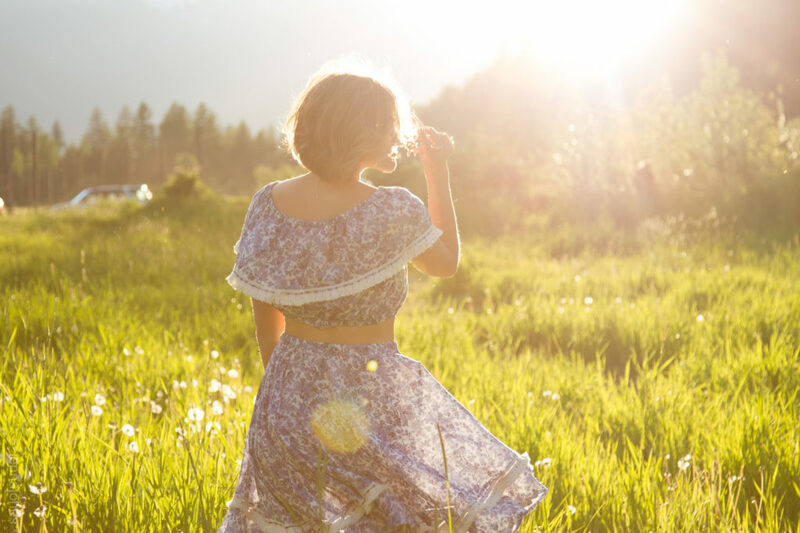 Plant protein is easily assimilated by your body to help you grow beautiful hair and nails. You really don’t have to worry about where you’re getting your protein from when you eat a whole-food plant-based diet. 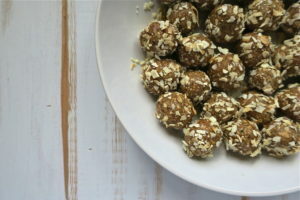 Eat when you’re feeling snacky, or low energy! Dates glorious dates. Melt in your mouth. Chewy. Sweet. 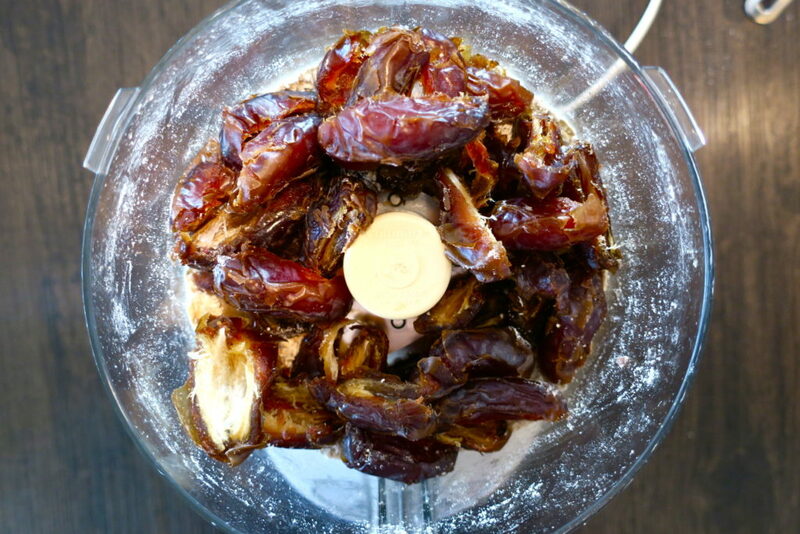 Dates are amazing for well…. anything really. Buy them by the box, and make sure they’re as juicy and fresh as possible. These little morsels are taken everywhere. In the car, on camping trips, in my camel back, on the plane… you name it. 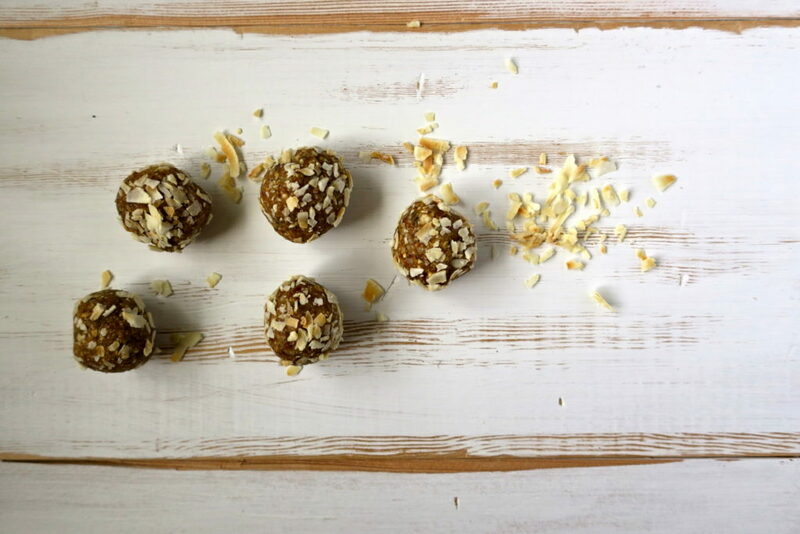 Packed with fibre, minerals and vitamins, dates are not to be afraid of. 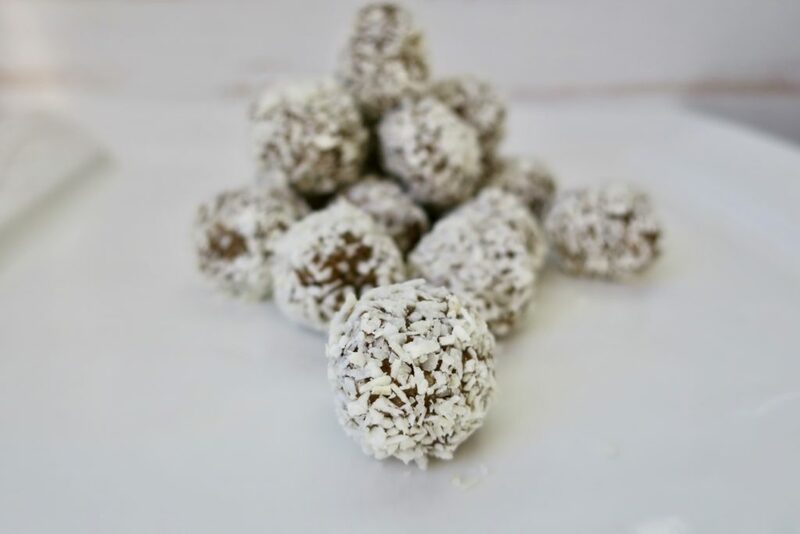 They’re a whole food, unrefined and easily digested for amazing, clean burning energy. 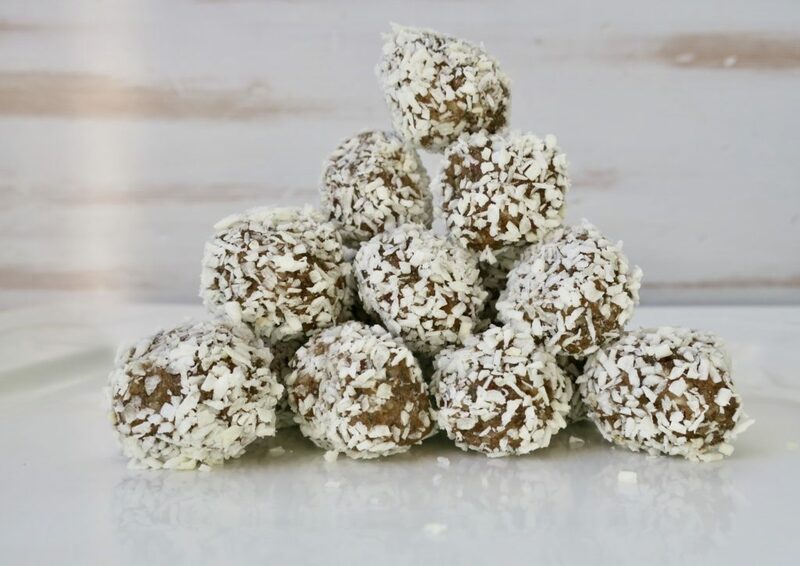 The perfect snack on the go. If you love caramel apples, take a bite of an apple with your date and call it a day. Seriously. Take them everywhere with you and you will be a happy camper. They are delicious as they are. But sometimes it’s nice to introduce them to a few other flavour buddies. 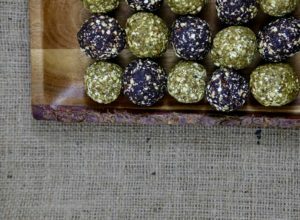 Hemp seeds add a great hit of flavour and essential fatty acids, oats create a cookie-like taste, and for the twist, quinoa puffs round out this delish ball with a surprising crunch and a complete protein (not that we have to be worried about protein, because it literally is naturally in every single whole, plant food). 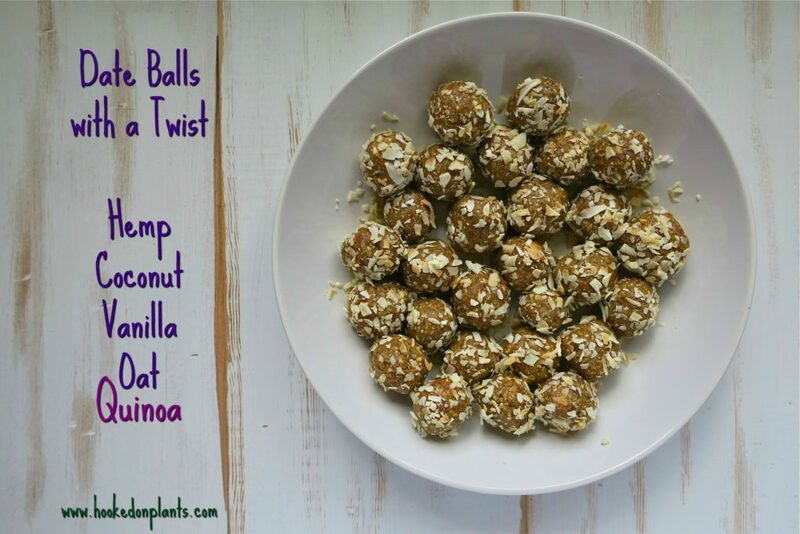 All you need is a food processor and a bit of a shimmy of the wrist to create these melt in your mouth hits of nutrition. 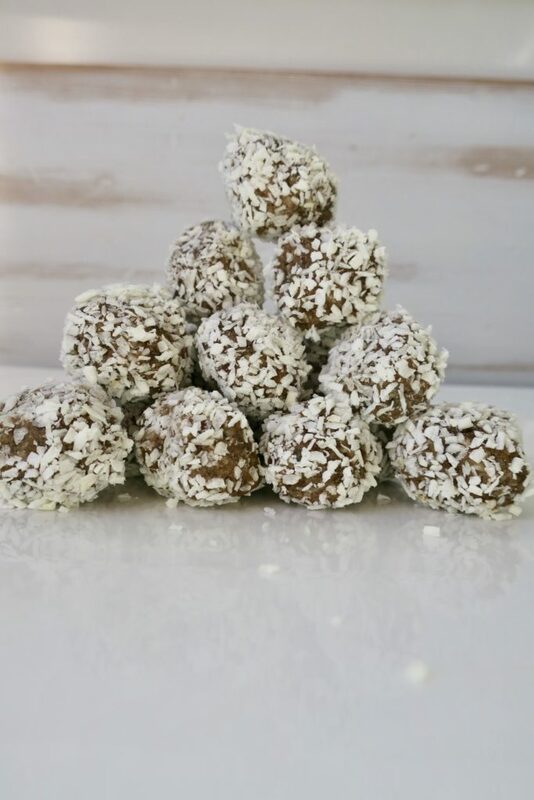 ~Dates are chalk full of fibre, magnesium, and selenium. 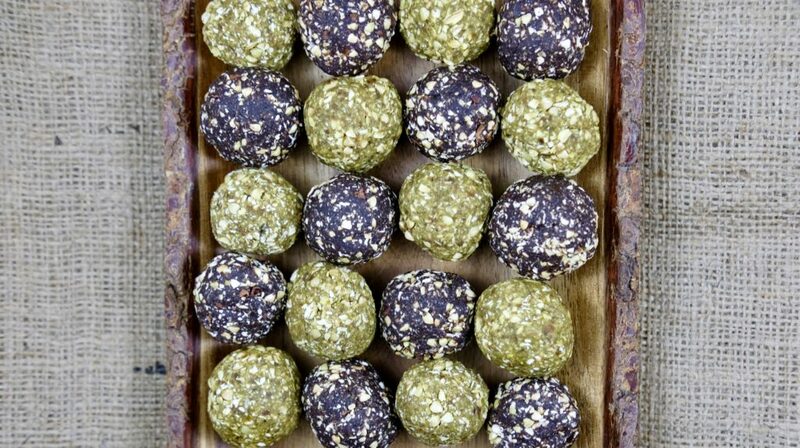 Plus they are stars when it comes to smooth digestion, nutrient-density, and improving the gut flora. This is all beneficial for weight loss, satiety, and clean burning energy. 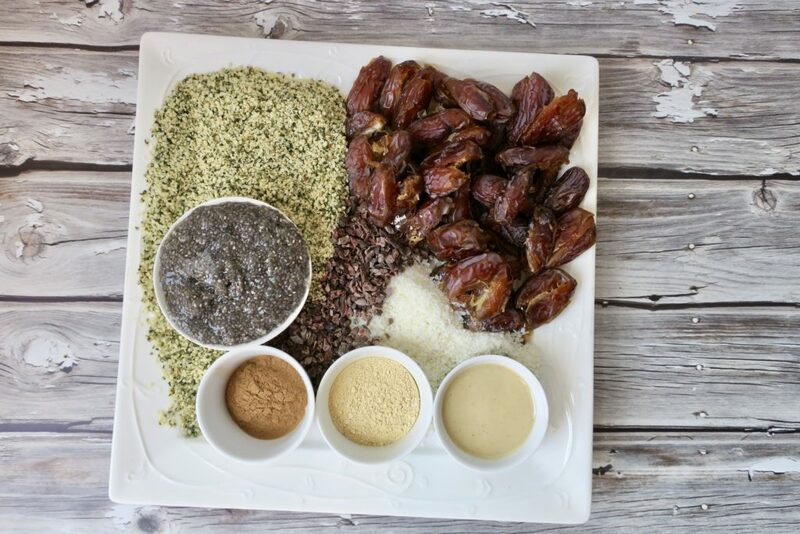 ~Hemp seeds are a great balance of 3:1 omega 3 to omega 6 fatty acids. In the Standard American Diet, there is WAY too much omega 6 fatty acids being consumed, and not enough omega 3. 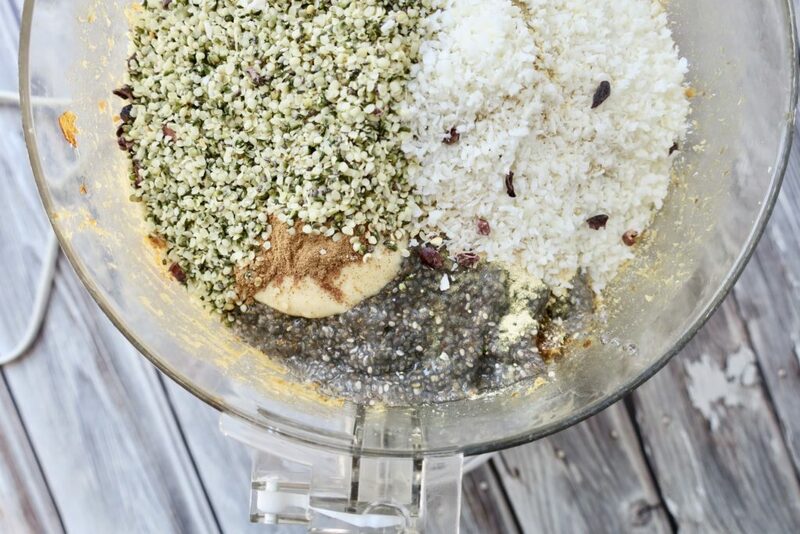 SO, hemp seeds are a perfect way to ensure you’re getting enough omega 3s in your life. This will help ward off depression, Alzheimer’s, rheumatoid arthritis, blood fat, asthma, and ADHD. 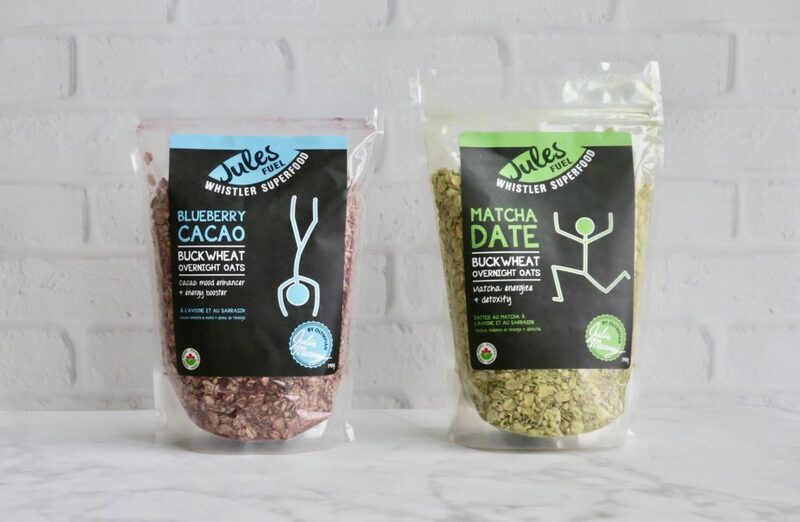 Plus it’s one of the best options for plant-based protein. 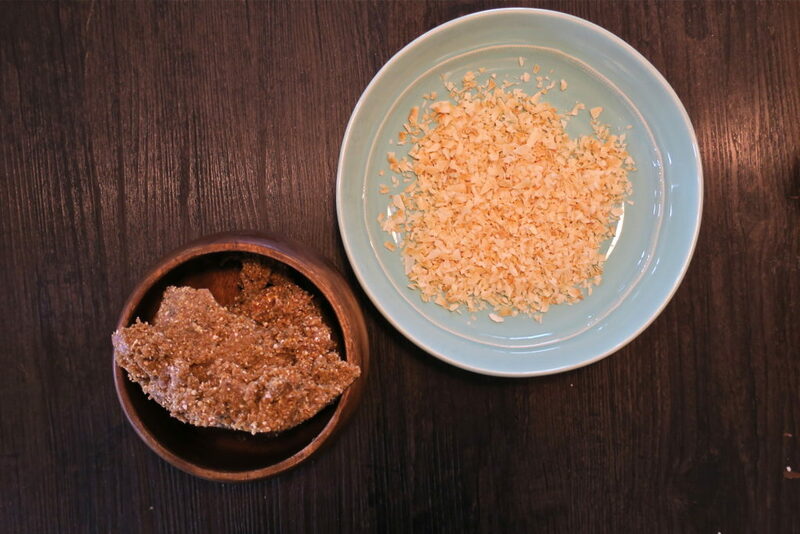 ~Coconut is packed with vitamin E, polyphenols, and vitamin A, which all work together to help lower LDL (bad) cholesterol levels. 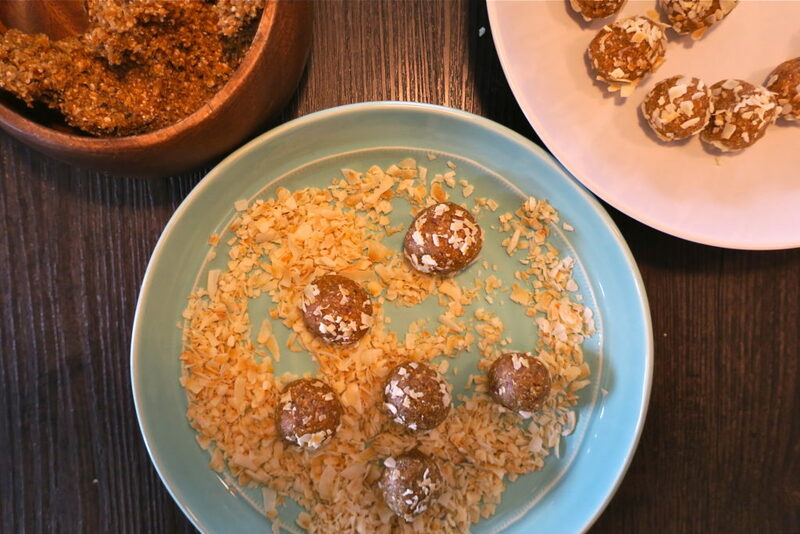 Shape date mixture into small balls with wet hands and drop them onto the plate (a few at a time). 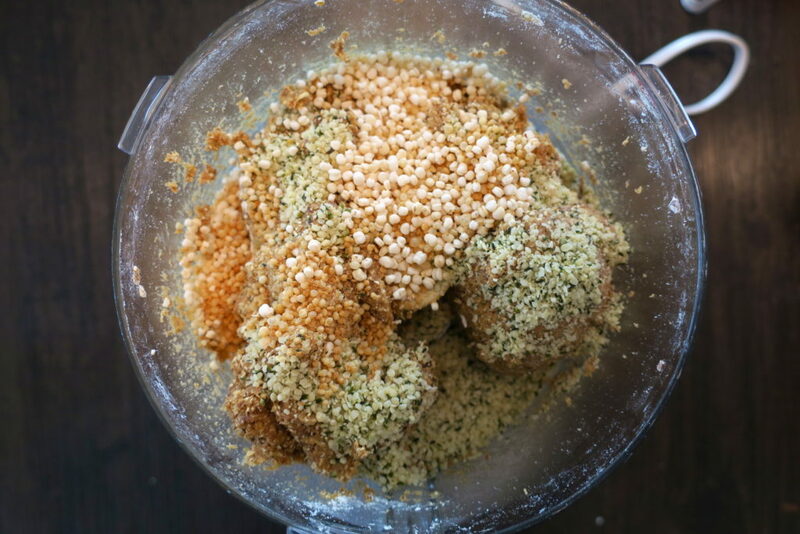 Shake the plate so the balls get coated with coconut shreds. 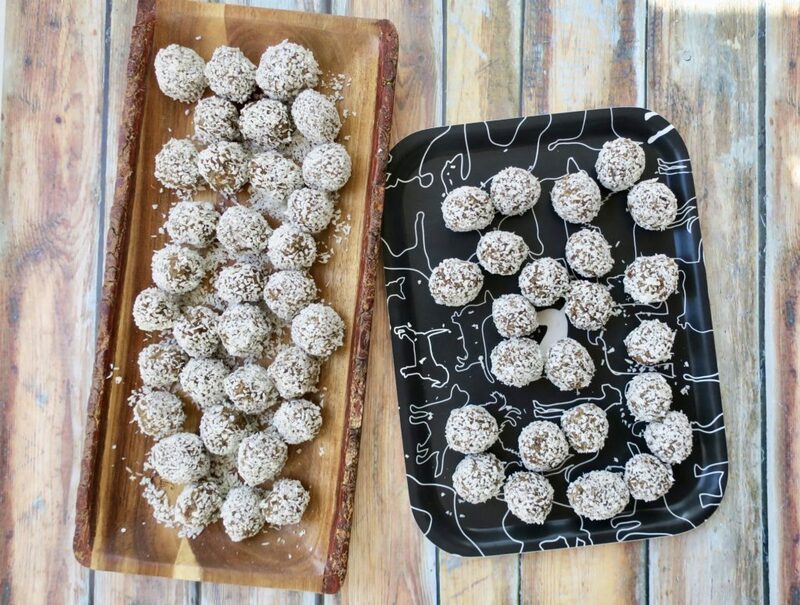 Once the balls are all shaped and coated, store them in the fridge so they’re ready for snacking! These keep their shape and travel like heroes! So bring them on hikes, bike rides, camping trips, you name it.